The Year of the Rooster 2017 is now well underway. It was brought to Stirling by a huge Chinese dragon, dancing to the delight of the crowds at the Albert Hall, followed by a night of spectacular performances of Chinese song, music, dance, gymnastics and magic. This was organised by the Central Scotland Chinese Association and Stirling Council. Stirling’s relationship with Chinese culture is young and strong, thanks to the students at the University of Stirling and the Confucius Hub concept in Stirling High and other schools, but there are also traces of older relationships to be found in the collections of the Stirling Smith Art Gallery and Museum. The punch bowl from which Bonnie Prince Charlie drank, at Bannockburn House in 1746, is of Chinese porcelain. 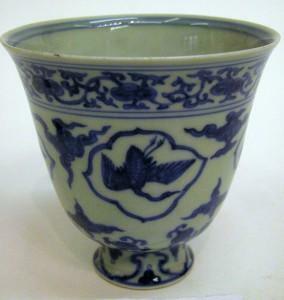 Even this is young in comparison to the lovely little porcelain cup from the Ming dynasty. It is 106 cm high but very rare, with markings confirming manufacture in the reign of the Emperor Jiajing, the eleventh emperor of the Ming dynasty who reigned 1521 – 1567. The cup is painted with four cranes which symbolise longevity, wisdom and nobility in Chinese culture. The cup, and many other artefacts and paintings were bequeathed by Stirling dentist L. J Platt in 1914.